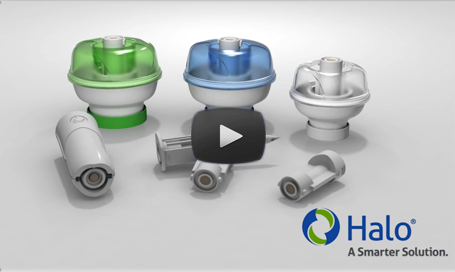 Introducing a novel new Closed System Transfer Device – the Halo. As part of an NCI funded research opportunity, we are looking for strategic partners in leading cancer centers to use and evaluate the Halo system. Our goal with this research is to demonstrate the improvements that the Halo device could bring to the safe handling of chemotherapy and other hazardous drugs. We have designed the Halo from the ground up. Focusing on the most important element of product design: the end user. Working with chemotherapy and other hazardous drugs can be dangerous. Exposure during preparation and administration of these drugs has been linked to significant adverse health effects – including cancer, infertility and more. Protecting equipment intended to shield you from the danger or these hazardous drugs are often complicated, difficult to use and provide incomplete solutions. That’s why Corvida Medical is developing a smarter Closed System Transfer Device – Halo. We are a passionate organization and our common purpose is care. That’s what drives us to create better healthcare technologies. We are committed to making your job easier so that you can focus on what matters most, providing the highest quality of care to your patients. © 2019 · Corvida Medical. All Rights Reserved. As part of an NCI-Funded opportunity, we’re looking for leading cancer research centers to partner with us to demonstrate the improvements that the Halo device could bring to the safe handling of hazardous drugs. Please fill in the form fields below to explore this opportunity further.